This is my first furniture project in a very long time. As some of you may know, I've been cleaning out my mom's house and took some very old, basic wood pieces of furniture home with me. Most of the furniture is as old as I am (old!) and very well made, of maple. This is one of the smaller pieces I have and thought it was a good one to start with. I painted it with Gliddens Primer/Paint mix and wasn't very happy with the way it went on. It was like painting with liquid rubber. I knew I was going to sand it and distress it so I didn't mind using it, however I will not use it again, especially on a larger piece. 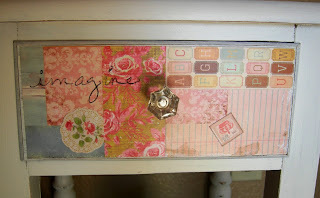 After sanding, I then collaged it with an assortment of scrapbook papers, mostly Prima of course! 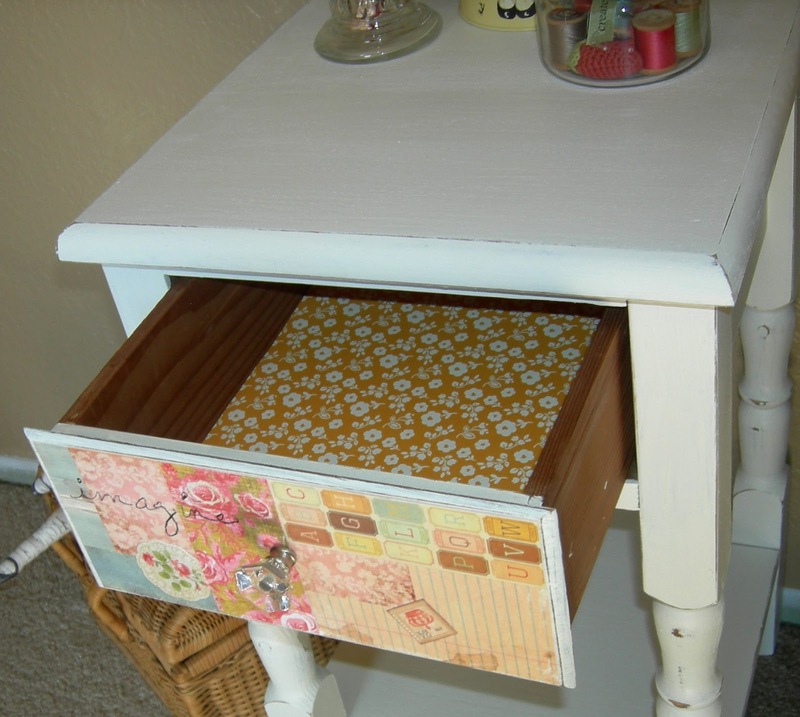 A screwed in a glass knob, lined the drawer with more paper and called it a day. I love it! It turned out to be an adorable addition to my craft space. It was originally in our Lake Tahoe cabin we had growing up and it is a small reminder of many years of wonderful vacation times with family and friends. It turned out just wonderful and will give you many more memories in the future. It's always great to make over a well made piece when the stuff you can get nowadays is no where near as good. What a lovely piece, as lovely as the memories it brings. My mom has been really into re-finishing furniture lately. I am sure she would love to see what you've done here- she is always looking for new ideas! 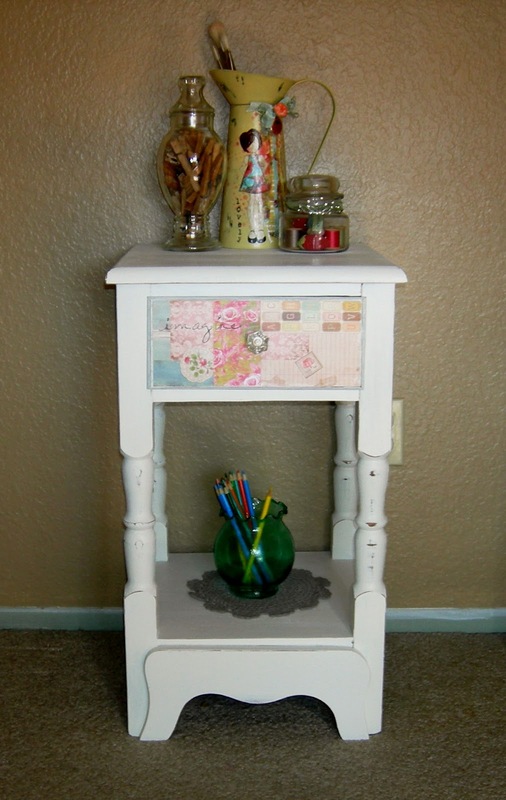 I actually just bought a similar end table off craigslist for her and she should receive it pretty soon with the in-home delivery service I had it shipped with. I bet she could do something pretty awesome using my old sports magazines or newspaper clippings. I can just imagine how awesome a Boston sports themed end table would look in my man-cave! LoVe, LoVe, LoVe this Julie! 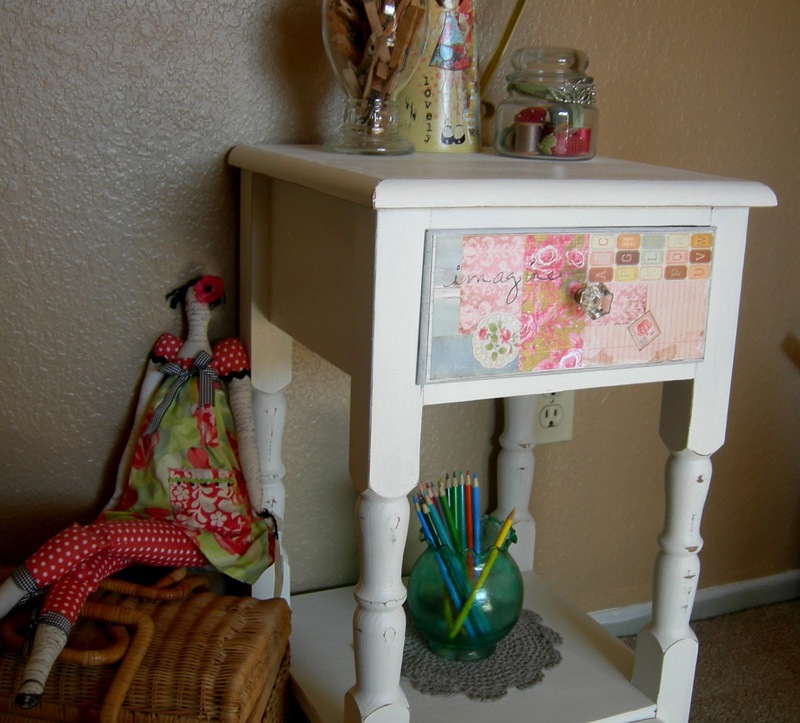 It is so charming and sweet, and I could see a 3 drawer dresser done in the same fashion incorporating a few of your girls in a layered decoupage for a child's room. Let's put crafty furniture and decor ideas in your next book!